Kosovo has been accepted as a member of UEFA. On Tuesday 3rd of May 2016 they became the 55th member of European football’s governing body. Kosovo can now also enter the 2018 World Cup after being accepted as members of world governing body FIFA. Generally, a player with dual nationality who has played for one national team is unable to switch to his second country, but in Kosovo’s case, FIFA is expected to look at individuals on a case-by-case basis. Fadil Vokrri, Kosovo’s football federation president, hailed the achievement as “historic”. What could have been for Kosovo had they been recognised years ago? There are a lot of Kosovan origin players who now play for their other respected international teams. One look at Switzerland‘s team and you see it is full of Kosovan players. Granit Xhaka, Switzerland’s captain, has just completed a £35 million move to Arsenal Football Club. Technically gifted, Xhaka reads the game well and is robust enough to do the nasty work as well. Granit Xhaka’s family moved from Kosovo to Switzerland during the conflict of 1990s. Granit Xhaka would have been the heart of the Kosovo team; the powerhouse that made Arsenal spend so much money on one of the players of the season in Bundesliga, while at Borrusia Mönchengladbach. Xherdan Shaqiri is another Swiss example. Xherdan was born in Gjilan, Kosovo, but moved to Switzerland at a young age. While at Bayern Munich, he won the Champions League and proudly showed his heritage by pulling out the Kosovan flag with the Champions League trophy. It was a proud moment for himself and his country. Shaqiri is a player who would have added pace, power, a venomous left foot and experience, having played for Basel, Bayern Munich, Inter Milan and now Stoke, to the Kosovo national team. Shaqiri has made 51 appearances for Switzerland, scoring 17 times, making him a very important player for the Swiss side. Arguably Switzerland’s best player. Another Switzerland player now, Valon Behrami. Born in Mitrovica, Kosovo. Again, another very experienced Swiss player who now plays his football in the Premier League for Watford, and has helped the The Hornets stay up in their comeback season. Behrami is a player that does the dirty work that no one else wants to do. He will play anywhere and do whatever it takes to win the game. Behrami has been capped over 60 times at international level by the Switzerland national team, playing at three World Cups and Euro 2008 since his debut in 2005. Here are Granit Xhaka, Xherdan Shaqiri and Valon Behrami in action for Switzerland. Moving on from Switzerland, Adnan Januzaj is another player who is eligible to play for Kosovo, as his family is Kosovar. Januzaj had a tough choice early on in his career regarding which national team to choose. You cant blame him though as he did have a handful. Januzaj then decided to represent the Belgian national team, choosing them over England, Kosovo and Turkey. Although, after a stop-start season with Man Utd, and not being chosen for the Euro 2016 with Belgium, Januzaj may well change his mind and would most likely switch from Belgium to Kosovo. Januzaj was not previously eligible to play for Kosovo because they were not recognised as member by UEFA and FIFA at the time he elected to represent Belgium. This would be massive for the Kosovan national team and could potentially be the start of something very exciting. With tremendous pace, excellent dribbling skills and vision, at just 20-year-old, Januzaj is an exhilarating prospect. 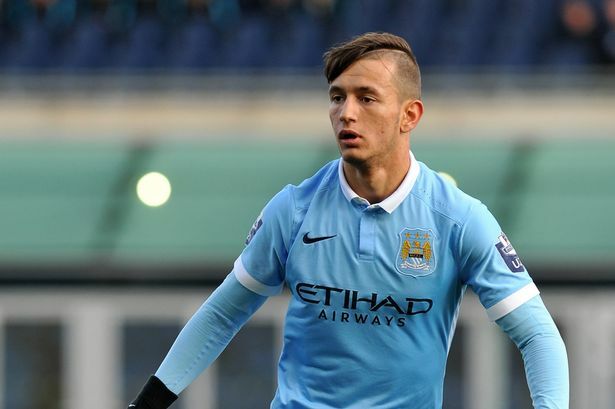 Another bright prospect for the Kosovan national team is Man City youngster Bersant Celina. Born in Prizren, Kosovo, he is another youngster playing in England. Celina can play for Kosovo or Norway as he has played for the U15s, 16s, 17s, and 21s. Unlike Januzaj though, Celina declared that he had refused a call-up to the Norwegian senior team, as he wanted to play for Kosovo, which was massive news. He made his debut for Kosovo at the age of 17. Celina also played a role in Man City’s first team this season making three substitute appearances, setting-up Sergio Aguero’s goal in the defeat to Leicester City. There is a bright future for Bersant Celina, for club and country. Almen Abdi is another player born in Prizren, Kosovo who, like Behrami, plays for Watford Football Club. An attacking midfielder who has scored 25 goals for Watford, Abdi was capped by the Swiss team in 2008 but has not been called up since. He could potentially be an asset for Kosovo. With his experience and depth of the game, the Kosovan national team would have him in a heartbeat. The Albanian national football team also has a number of Kosovan players. Lorik Cana, Albania’s captain, was born and raised in Prishtine, Kosovo, and is the heartbeat of Albania’s side. He is a very influential footballer and the biggest name in Albanian football. Should he decide to join the Kosovan national team, it would be a great start for the country. Lorik Cana has played for Paris Saint-Germain, Marseille, Sunderland (where he became the first Albanian to play in the Premier League), Galatasaray, Lazio and Nantes. Other players include Etrit Berisha (Lazio), Shkëlzen Gashi (Colorado Rapids), Mërgim Mavraj, (FC Köln), Ermir Lenjani (Nantes) and Taulant Xhaka (FC Basel). All of whom will be attending Euro 2016 with Albania with an open mind, to potentially consider a move to the Kosovo national football team. Here is a team that could have been put together. A very strong team full of talent that would have been a force. It is such a shame that it will, most likely, never happen. There we have it: what could have been for Kosovo. On one hand it is a shame as Kosovo would have been a strong team, but on the other, considering the circumstances, Kosovo has done well to be in a position where they can now move forward and establish themselves as a strong force, produce more talent and compete for future tournaments.